270 horsepower and 258 pound-feet of torque from a 3.5-liter DOHC 24-valve six-cylinder good for a 0 to 60 MPH time of 5.6 seconds. The Altima Coupe is a pure sport two-door. A longish hood and long sweeping body are accentuated by cleanly outlined wheel arches. The front is staunch and bulges in the center as if to subtly suggest the power that lie beneath. The proportions are due in part to a wheelbase decrease of 4 inches from the sedan. The back-end is well-defined and curvy sloping toward the trunk and spoiler. The sloping rear and large piece of rear glass give the driver ample rearward visibility. The Altima’s cabin is roomy and comfortable up front while a bit squished in the rear – best left to kids and the groceries. The overall level of fit, finish and refinement inside the Altima is quite good and the leather seating and accents felt rich and durable. The Nissan Intelligent Key allows the car to be started with key in pocket by depressing the clutch and pressing a red button to the right of the steering wheel. The Altima’s front buckets are relatively large and comfortable and offer up ample support in the turns. Beyond the seats, the dash is functional and stylish – a happy medium between boring and over-the-top. The layout feels natural and balanced. The steering wheel is comfortable and covered with large, easy to use buttons for controlling the radio, Bluetooth and cruise control. Behind the wheel, the gauges are arranged in a practical shape with speedometer in center, tachometer on left and fuel gauge and water temperature on the right. LCD displays give you trip information, outside temperature, safety data and MPG info. Our car had a premium audio upgrade with a 4.3-inch color display, Bluetooth phone, USB port with iPod connectivity, XM Satelite radio, a rearview monitor and other great premium features. The nine speaker Bose system sounded rich and full. The center stack is well desigened and easy to navigate while driving. You get three large knobs for controlling the interior dual climate. In front of the center stack you’ll find the gear selector for the six-speed manual transmission and pull-style handbrake. In front of the passenger seat is a truly ginormous locking glovebox, which will easily accommodate a laptop computer. There’s also a large storage bin with a hinged cover at the bottom of the center stack. Trunk space is not the Altima Coupe’s game, with only 8.2 cubic feet of available trunk space. It is after all a coupe. The Altima 3.5 SR provides plenty of snap through a close ratio 6-speed manual transmission, taut suspension tuning and front-wheel-drive configuration. In a class characterized by vanilla, the Altima is anything but. The 3.5-liter V6 makes a potent 270 horsepower and is reminiscent of the 3.7-liter V6 in the 370Z. You’ll find plenty of power on tap for passing and getting started from a stop. The six-speed manual, available only in the Coupe, is choice for fun and sporty driving. The manual is manageable and relaxed while offering sharp, precise shifts. The cars handling is tight and responsive with true and reliable steering. Despite its strong handling characteristics the ride isn’t harsh over less refined surfaces. A minimum amount of tire noise and vibration passed through into the seating. Torque steer – the tendency to jolt to the side under acceleration – is surprisingly well-managed despite having nearly 300 hp on tap. The vented front disc and solid rear disc provide ample stopping power when combined with the electronic brake-force distribution (EBD) which optimizes the front/rear brake balance depending on the cars load. 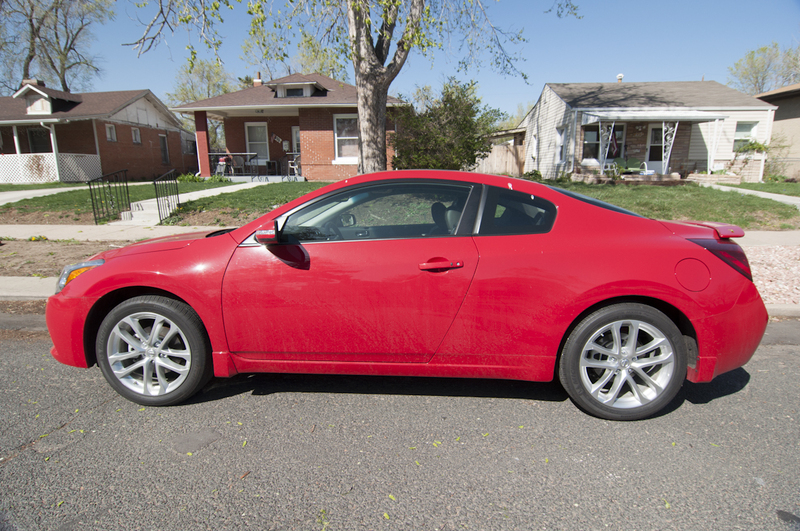 The Altima 3.5 SR Coupe is fun to drive and provides fuel economy ratings of 18/city and 27/highway – I average about 22. While Honda’s Accords are well-balanced and the Toyota Camry is more refined but far less responsive the Altima 3.5 SR Coupe chose performance and thus is best suited for a car enthusiast looking for sporty handling and quickness. The most powerful and most refined Altima paired to a fantastic six-speed manual transmission available only in the Coupe. Altima Coupe 3.5 SR base brice is $30,760 add a spoiler, destination charge and mats for a final price of $32,165. If you want power on tap and fun driving dynamics and don’t mind sacrificing carrying capacity or rear passenger comfort you’ve got your whip.